A recipe for a cake made with fresh nectarines and flavored with cinnamon. 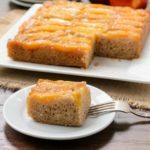 It is baked with fresh fruit on the bottom and then turned upside-down to serve. Preheat the oven to 350 degrees F. Lightly grease the sides only of an 8-inch square cake pan. Stir together 2 tablespoons butter, light brown sugar, and 1 teaspoon vanilla in a small bowl. Spread mixture evenly over the bottom of the cake pan. Arrange the nectarine slices in rows over the brown sugar mixture in the pan. Whisk together the flour, cinnamon, baking powder, salt, and nutmeg in a bowl. Add the remaining 6 tablespoons butter and sugar to the bowl of a food processor fitted with a knife blade. Process until fluffy. Add the eggs and remaining 1 tablespoon vanilla. Process until combined, stopping to scrape down the sides of the bowl if needed. Add the flour mixture and milk. Pulse 2 to 3 times or until flour is moistened. The batter does not have to be completely smooth. Spoon and spread the batter evenly over the nectarine slices. Bake until the center springs back with gently pressed, about 40 to 45 minutes. Cool cake in the pan on a wire rack for 5 minutes. Use a knife to loosen the edges of the cake from the pan. Invert the cake to a serving plate. Serve warm or at room temperature.